Life. Who chooses who gets to enjoy this gift? The people in Syria had a serious complaint with their leader so they organized mass protests. The press has been reporting how the Syrian government has cracked down too harshly on protesters. I’m trying to understand what is really going on here. The occupy movement was started in the United States by Americans who didn’t like what the government was doing. Then the press reported that the government cracked down too harshly on protesters. What is the difference? Why is it that American governments can justify assaults on their people and simultaneously enforce a policy of zero tolerance on FOREIGN leaders who commit the same crimes? In America these viscous attacks are being swept under the rug and hidden but they still remain. Why are the crimes of foreign leaders more important than American politicians? Mubarak, The Egyptian leader was ousted for his harsh treatment of protesters but what role did the United States play? Well, the US only sold him the gas and weapons he attacked his people with no big deal right? It’s just some Arabs, or whatever, …right? The “Arab enough” countries and people seem to be the latest trend, why is this? Do you think most Americans know the difference between an Indian, an Arab, and a Persian? Do you think most Americans could find India, Iran, or an Arab country on a map? Do you think most Americans could tell the difference between an Israeli and Palestinian? If no why get so involved especially when your broke? Syria’s president Assad was caught doing many mean and nasty things he should not have be doing so the people in Syria called him on it and showed up to protest. The Syrian government responded with violence. When banksters got caught stealing the economy Americans showed up to protest. The government responded with violence. This made me wonder, what else is going on in Syria that is also happening in the United States? In Syria Obama’s rebels have invaded the country and are carrying out violence daily throughout the country. The UN has reported over 9000 civilian casualties so far and counting. That’s 9000 vs 19. In America the second shooting incident was called a domestic act of terrorism. Not the first. Not sure how or why this was determined they said the shooter was in a racist hate group. There are also eye witness reports of multiple shooters that isn’t being discussed by the talking heads for some reason. In Syria the rebels that Obama is supporting with guns and money are now working with the terrorist organization Al-Qaeda. Not sure how helping known terrorists will defeat terrorism but this is what NBC News reported. I was shocked to hear and see an NBC crew embedded with the Syrian “rebels” on Sunday evening news like they were the Marines or something. One of the rebels they interviewed openly declared he would gladly raise the Al-Qaeda flag if they supported him. WTF!? I thought they said Al-Qaeda was responsible for 911 maybe they have changed the story again? The difference that I notice is the number of casualties is much greater in Syria and actually the role of the rebels remains unclear. How can you trust a terrorist? How many of the casualties being blamed on Assad’s government were actually caused by the rebels Obama supports? Do you think you can trust a rebel? There have only been reports of these “rebels” desecrating churches, executing people, and who knows what else they have done. The one similarity I notice in America and Syria is U.S. Tax payer money apparently paid for the training/equipment of both. The two recent US shooters and the Syrian rebels seem to be getting their funding from the same source. Obama openly supports the rebels, the batman shooter received a $26,000 government grant and was in a government psych program, the Wisconsin Shooter was in a psych program also and was ex military. Talk about Ironic. Does this mean the real person behind all of this is you, the taxpayer? 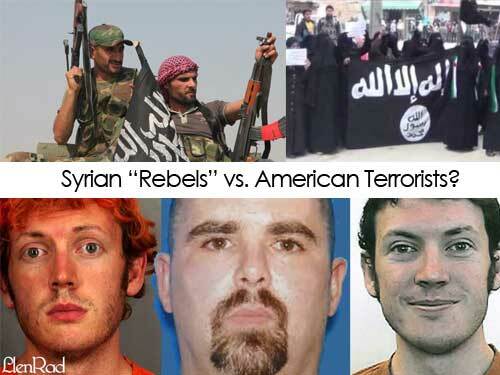 Syrian “Rebels” vs. American Terrorists? ‹ Criminal Justice: Why is American manufacturing under attack by the FEDS?